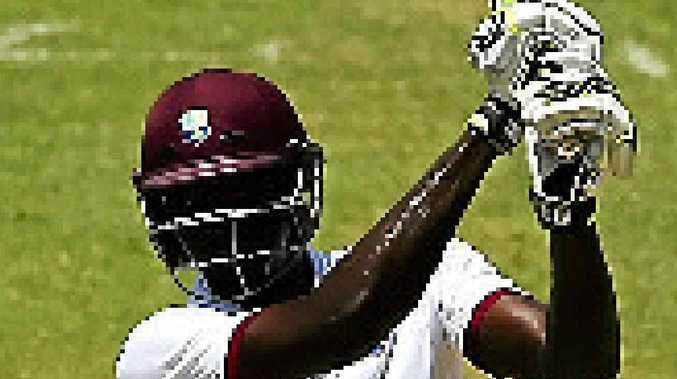 AN unbeatean 82 from 63 balls by Jason Holder was the only real resistance offered by the West Indies on day three of the second Test in Kingston. Holder's swashbuckling knock, which included 12 fours and two sixes, helped the home side reach 220 and avoid the follow-on. The 23-year-old (pictured) combined with Kemar Roach for a 77-run partnership, the second-highest ninth wicket stand by the West Indies in home Tests. Paceman Josh Hazlewood (5-38) was the pick of the Aussie bowlers. Australia's top-order then spent some valuable time in the middle, Shaun Marsh (69), David Warner (62) and Steve Smith (54 not out) all notching half-centuries before the declaration came at 2-212 - a lead of 392. Any chance the Windies had of running down that total was gone early in its second innings, with left-arm quick Mitchell Starc removing openers Kraigg Braithwaite and Rajendra Chandrika for ducks.